The 100 plus recipes found in Easy Indian Cooking have been modified to suit a modern lifestyle, and all of them can be prepared with ingredients available at any local supermarket or health food store. The preparation and cooking techniques have been simplified to save time without sacrificing any of the flavors of authentic Indian food. This Indian cookbook contains 101 recipes for any occasion. Breakfast, lunch, or dinner, this book is sure to be a winner. Chef Hari Nayak brings the diverse flavors of Indian cuisine right to your table. 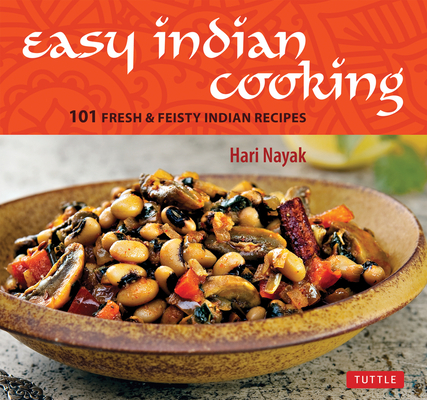 This Indian cooking book is loaded with detailed photographs so you can make the recipes just like Chef Nayak. Hari Nayak is known for his simple approach to food. He stays true to the core Indian values of the dishes he creates. Since graduating from the Culinary Institute of America, Hari has worked in the food industry for more than 15 years--including stints at renowned New York restaurants like Aquavit and Daniel. His other cookbooks include Modern Indian Cooking and My Indian Kitchen. Hari lives in New Jersey and appreciates everything that cooking has brought to him. Jack Turkel has been a professional photographer for more than thirty-five years. From the space shuttle and mountain tops to the uniqueness of his photographs of the everyday, his creative eye has expertly captured an impressive list of subjects and settings. He is now focusing his experience on the art of food photography and styling.